Saurolophus is a large hadrosaurid dinosaur which lived approximately 70 million years ago during the late Cretaceous Period. It was first discovered in 1911 by Barnum Brown at Red Deer River in Alberta, Canada. It was named Saurolophus by Mr. Brown in 1912—a name which means “lizard crest”, so named because this dinosaur had a long cranial crest that looked very much like a spike. 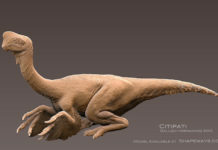 After the initial specimens of this dinosaur were found in Canada, subsequent specimens have been found in parts of China. 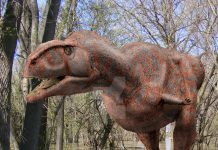 Saurolophus was a duck billed dinosaur that was approximately 40 feet long, 17 feet tall and weighed around 3 tons. As previously stated, it had a spike like crest on its head and had a toothless beak. It had hundreds of cheek teeth which it used to grind up its primary food source—plants. 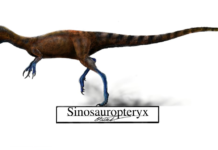 Another interesting fact about Saurolophus is that it had a ring of bone around its eyes. Paleontologists aren’t exactly sure what this was for—defense perhaps—but this dinosaur was the first hadrosaurid to have been found with one of these strange bony eye rings. 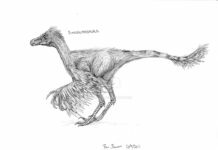 Fossilized remains also seem to indicate that Saurolophus also had a large flap of skin on its head that it could inflate. If this was indeed the case, then this flap was probably brightly colored and its purpose would have been to attract a mate. 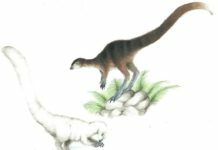 Since Saurolophus was hadrosauraur, it probably traveled in herds. This would have given individual members of the herd protection from predators. 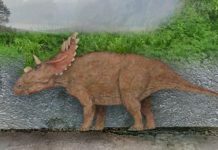 These dinosaurs were also herbivores that probably lived off a diet of conifers, seeds and twigs.